Are you a motocross fanatic who is looking for the perfect pair of prescription motocross goggles? Are you a little worried that purchasing a pair of prescription motocross goggles alone may not be the best decision because you cannot actually try them on? Well, we want you to take a deep breath and get that thought out of your mind. Why? The right pair of superior motocross goggles will be designed to meet your needs and fit your face comfortably. Superior quality motocross goggles are definitely important when you need to defend yourself against dirt, mud, and other debris. It is also important that you have the best vision possible so you can maximize your reactions and your reflexes when you need to adjust to the changes in the terrain. Unfortunately, many riders who have to wear spectacles will find themselves facing a variety of problems because the glasses they are currently wearing do not fit well with their helmet. Generally, eyeglasses are not going to sit perfectly in one spot for too long, especially when they are being pushed by the frames of motocross goggles. Motocross Goggle Inserts: What Are They? If you want to have the ultimate comfort when riding with motocross goggles, one of the best options you have is to use prescription motocross goggle inserts. We all know how quickly eyeglasses can fog up, especially when they do not have any anti-fog coating on them. Eyeglasses will also rest closer to your face because that is where the heat is coming from, and unfortunately, this will cause more fog to form on your glasses. A prescription goggle insert will be treated with the fog protection you need in the form of an anti-fog coating. The motocross goggle insert will not sit close to your face, but it will sit closer to the shield on your goggles that is ventilated. Since the prescription lenses in the insert frame will sit up against the back surface, your goggles shield will not be as susceptible to misting as it would be without the inserts. The high-quality motocross goggles will have a venting system that will protect your goggles from misting and fogging. Goggle inserts have more comfort in them than wearing a pair of regular eyeglasses. When you wear inserts, you will quickly discover that they are more comfortable than wearing a pair of eyeglasses. You can also say goodbye to the pressure that forms on your temple when you wear eyeglasses. Goggle inserts will be easy to put in and they will not be complicated to take out when you need to clean them. Prescription motocross goggles are also safer than wearing regular eyeglasses. If you have had to replace eyeglasses multiple times because you are constantly losing them or breaking them, you will be glad to know that you will not have to worry about this problem with goggle inserts. Motocross Goggle Inserts: How Do They Work? You can find motocross goggles in a variety of sizes and shapes, and this means you should be able to insert these into any type of goggles that are on the market. The prescription you have been given by your eye doctor will go into the insert, and your inserts will also be treated with an anti-fog coating. Your prescription will be very secure because the insert will sit securely inside your motocross goggles. Your prescription will remain in place and everything will be perfectly aligned. What About The Goggle Accessories? You cannot forget the accessories when you are purchasing motocross goggles, right? You can also make the choice to purchase goggles that are already equipped with the extras you are looking for. One of the popular choices when it comes to motocross goggles is tear-offs. Tear-offs can be attached to the lenses of your motocross goggles. When your tear-offs become covered in dirt, mud, etc., you can simply tear them off and a new one will be revealed. You will not have to worry about stopping your bike and cleaning your glasses of the dirt and mud that is splattered on it. You will always have the clear vision you need while you are riding. It is important to know that you should only have about five tear-offs on your goggles or your vision will be obstructed due to the blurriness. Another option that you can choose from is roll-offs, but it is important that you know roll-offs cannot provide you with as much clarity and protection as tear-offs. Many riders will prefer to use tear-offs because roll-offs can obstruct their vision. When you want to get out and enjoy the sport of motocross, it is important that you make sure you have the right type of motocross goggles. 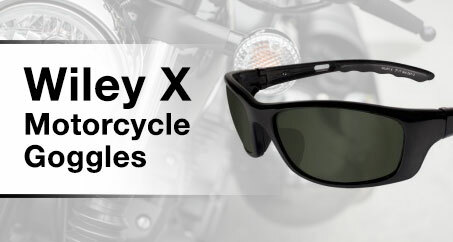 As someone who needs a prescription in order to see better, you will need to choose the best pair of prescription motorcycle goggles. You can also make the decision to use inserts. Many riders see their goggles as the most important asset to have, but we think the most important asset is a clear vision. When your vision is clear, you will be able to see everything that is taking place around you. Insert frames with prescription lenses should be available for purchase when you make the decision to buy yourself a new pair of motocross goggles. However, insert frames are generally a universal frame. This means you should be able to buy insert frames with your prescription and they should easily fit into your current pair of motocross goggles. Are you getting ready to enjoy the summer on your bike? Are you ready to invest in a pair of motocross goggles? Make the right decision when it comes to choosing your protective eyewear; your eyes will eventually thank you for it.